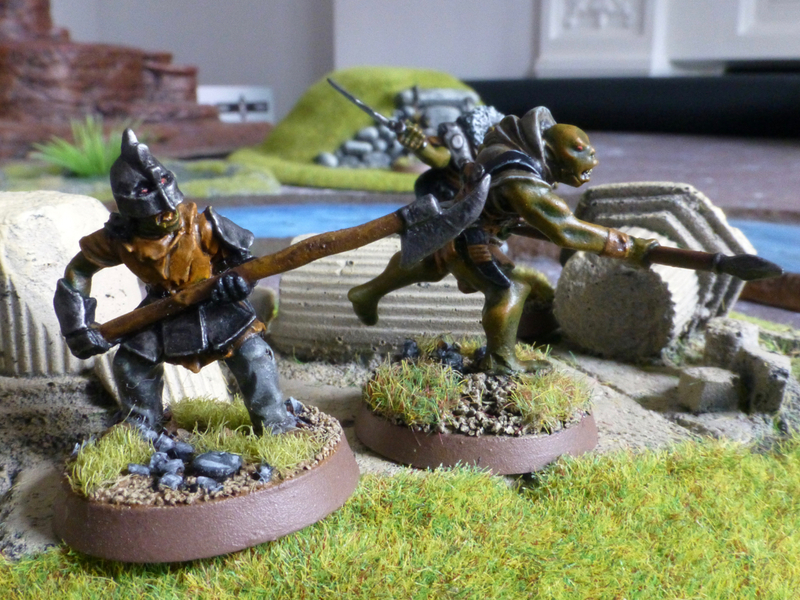 Two important characters I had yet to paint up for my fledgling Dwarf and Goblin Oathmark forces were their respective spell casters. 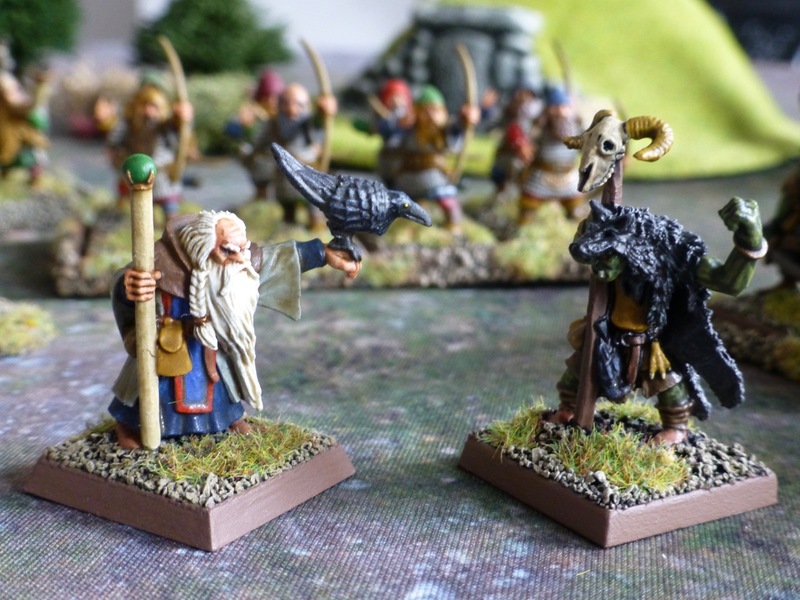 Available as metal sculpts from the talented hands of Mark Copplestone, these are very flavourful figures that I wanted to show going up against each other in a battle of magical powers. 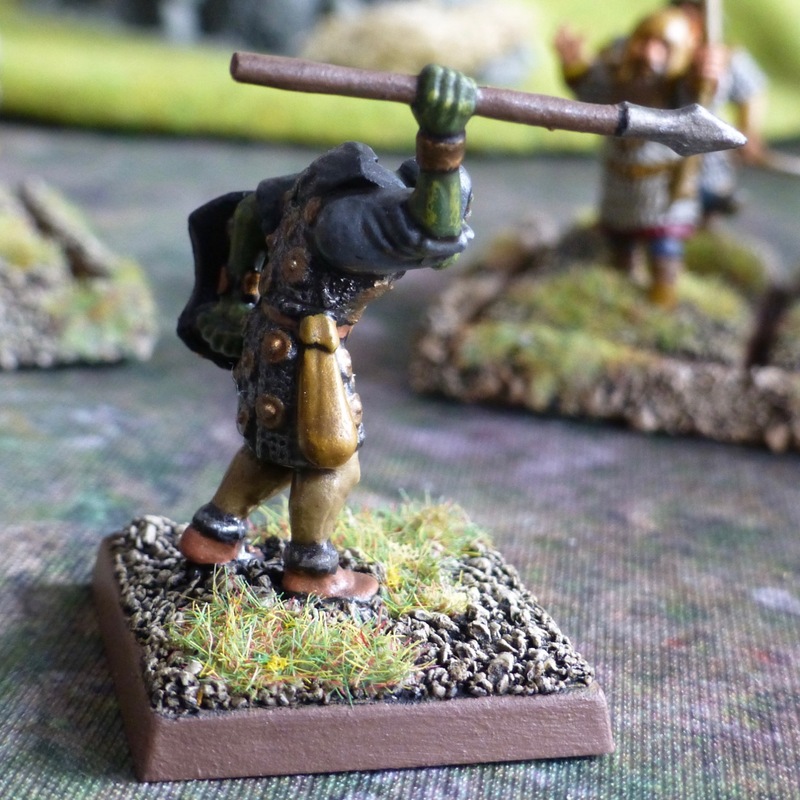 I also converted one of the Goblin spearmen to be a javelineer. Using the ancient peltast as a model, I choose the smallest of the shield sizes (which actually has a shape quite reminiscent of Thracian equipment) and went with lighter armoured body parts. For the javelin, I cut the spear tip off and made it both shorter and narrower. Then I shortened the wooden shaft at both ends and glued the tip back onto the bottom end, so the pose is now that of a throwing arm. A little bit of resculpting on the right shirt sleeve and the chainmail was needed, as the arm is normally expected to be attached in a downward facing position. 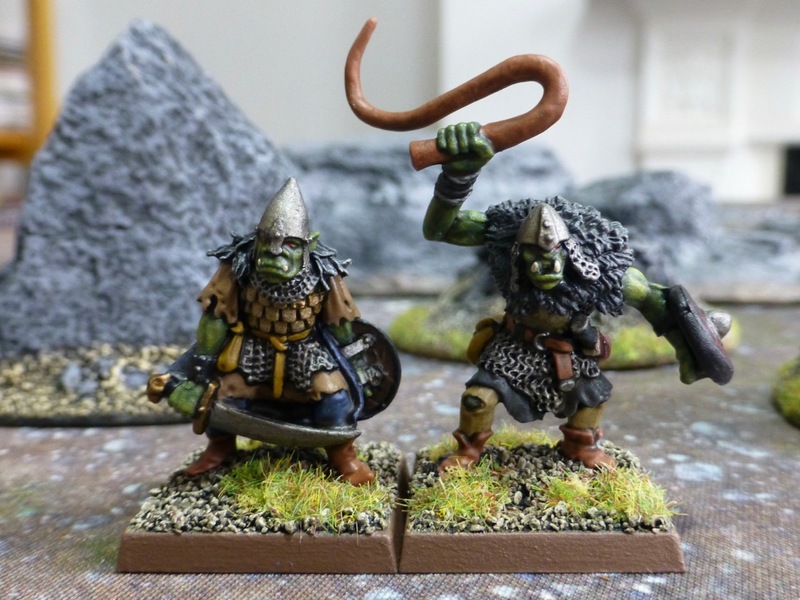 For my eight strong unit of Goblin warriors, I also painted the remaining two champion sculpts in metal and assembled one plastic fighter (on the left below). With these finished, I’m just in time for the Elven pre-orders to begin! 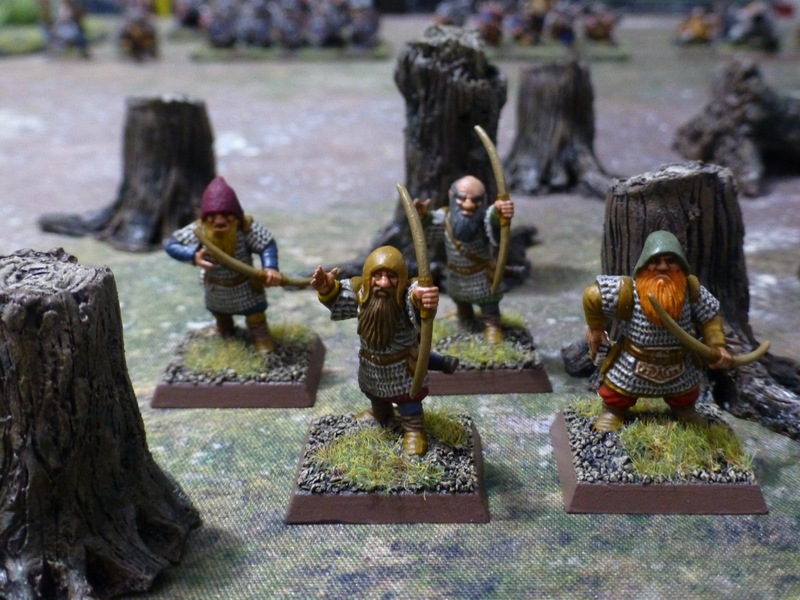 Having the core of my Dwarf army ready to battle it out for the Lost Age in Oathmark, it’s time to meet their challengers. 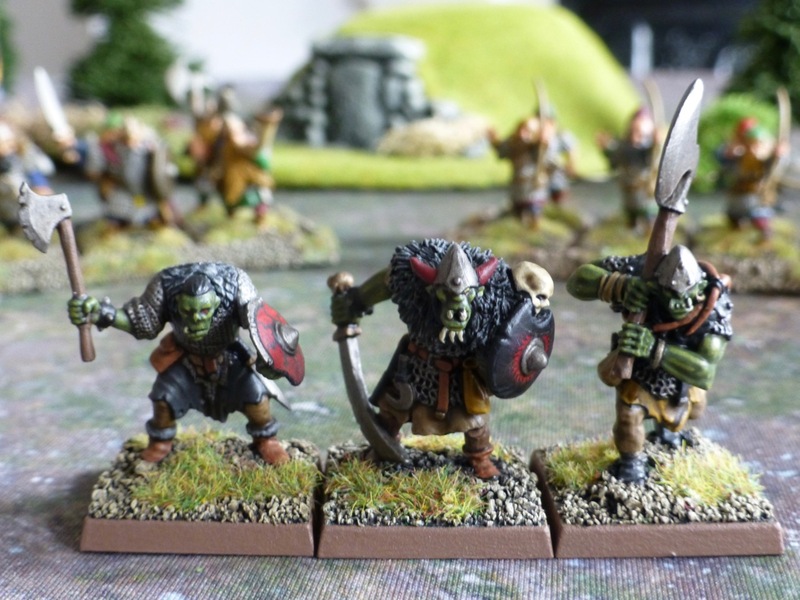 I got in for the Nickstarter by North Star Figures again with their Goblins, giving me a plastic regiment box of 30 plus a bunch of metal command models. Making a start with those and adding a plastic banner bearer carrying a standard by Little Big Men Studios, I decided on a colour scheme for this new army. 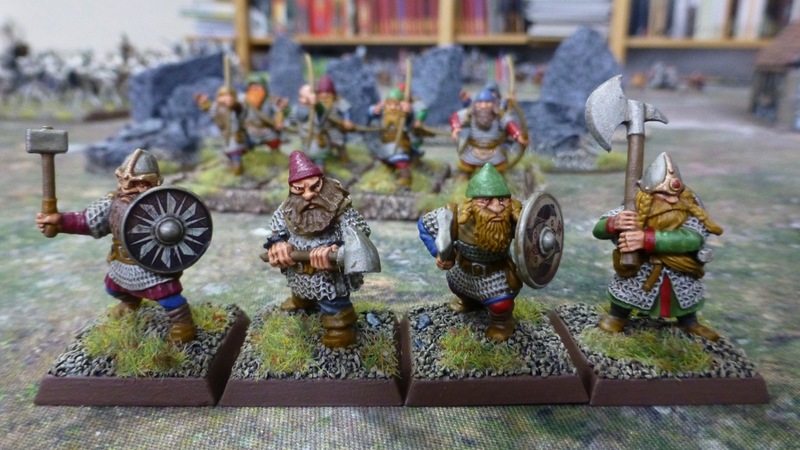 Sticking with browns and greys and the odd blood red spot colour (in line with the banners and shield transfers I bought), they’ll have their own and unique style contrasting with the Dwarfs. Also, I am using Army Painter Quickshade Dark Tone rather than Soft Tone for them. 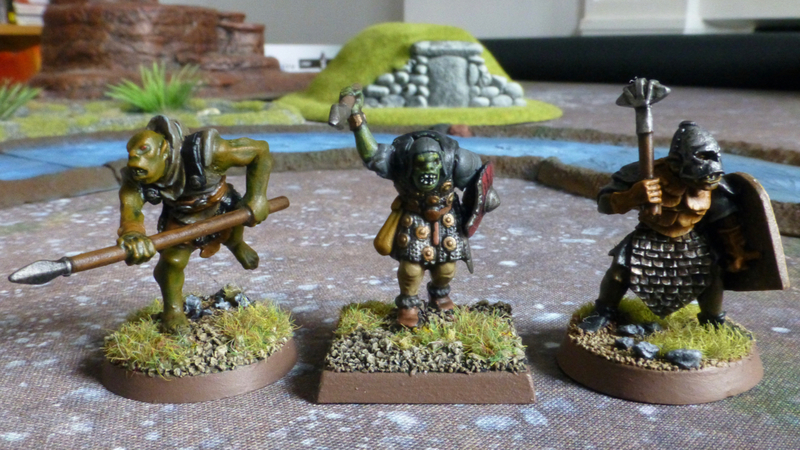 I might hold back more of the plastics as I’d like to see some army lists coming out first. 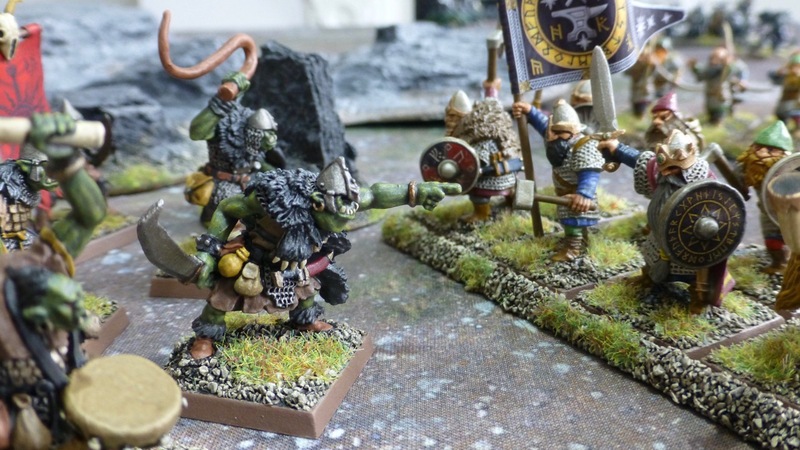 Rather than building spear armed troops I’d fancy having a unit with javelins which should be easy to convert, so that the army composition for the Goblins does not just mirror the Dwarfs at this stage. 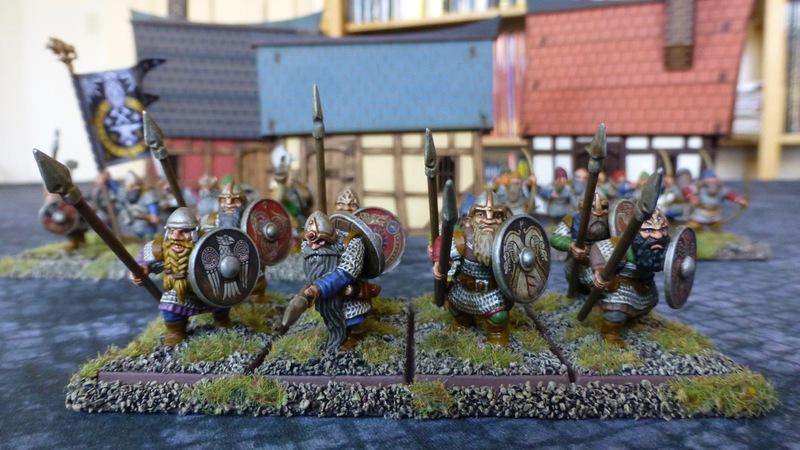 These spearmen complete the third unit type for my Oathmark Dwarfs, so I now have a vanguard force ready and waiting for the game. 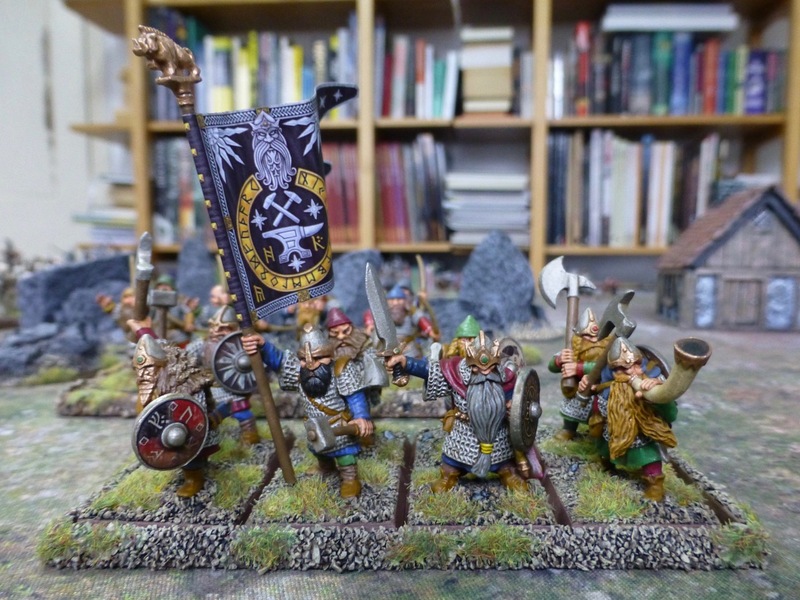 Once again, the shield transfers from Little Big Men Studios together with Army Painter Quickshade allowed me to get them done to a tabletop standard quickly. Now I have 12 models left to build from the box set. I’ll leave these until the game rules are released with regards to unit sizes and formations, standards and leaders. 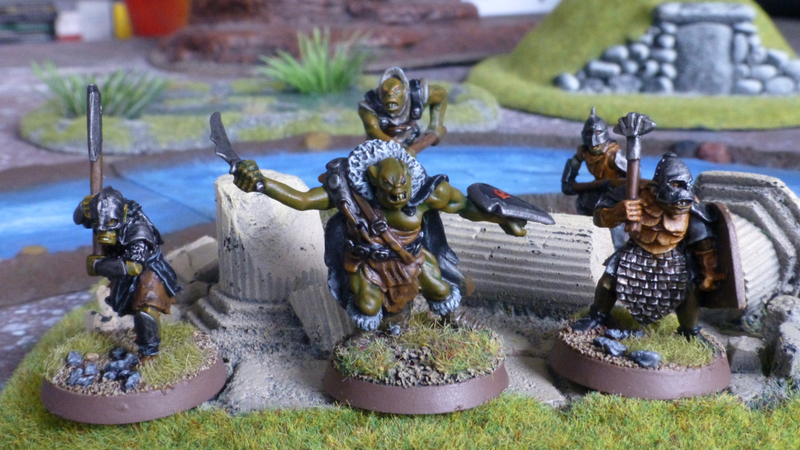 Moving on to some goblins then! 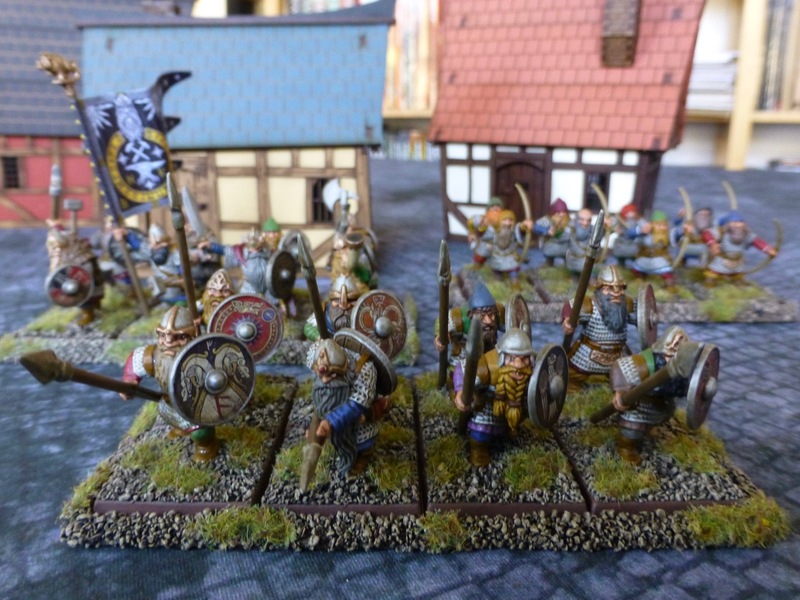 The second unit for my Oathmark Dwarfs consists of warriors with hand weapons and shields, lead by their king, a standard bearer and a horn blower. Three of these figures are made from the plastic set, while the rest are the additional metal sculpts that are currently available, including the Nickstarter exclusive chap. Again, these guys just took a layer of base colours followed by Army Painter Quickshade Soft Tone and a single highlight on the skin. 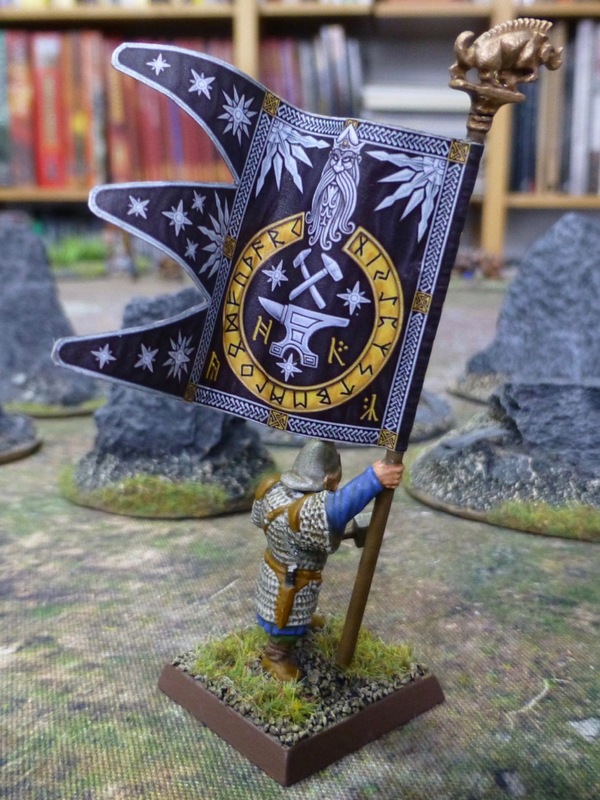 A great addition to the range are the specifically designed banners and shield transfers from Little Big Men Studios. 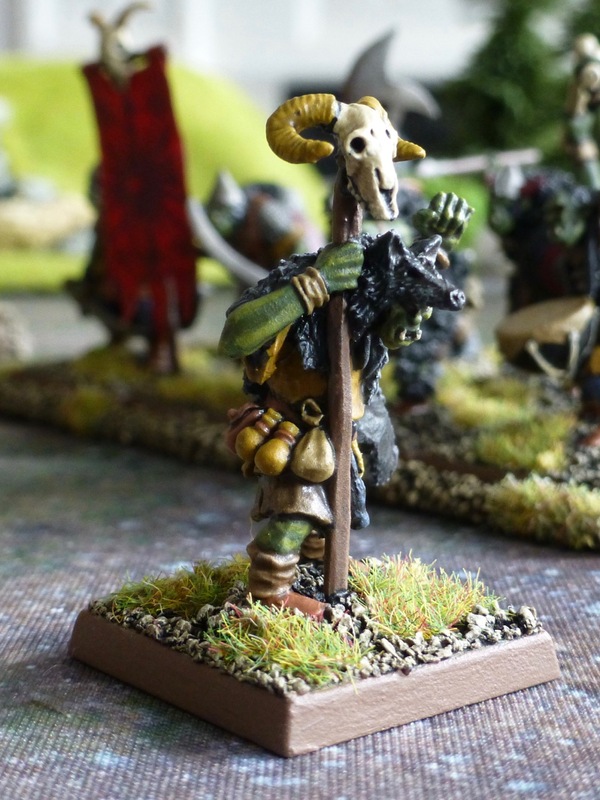 A big time saver, apart from the fact that I would never be able to paint anything even close to their level of detail and quality. 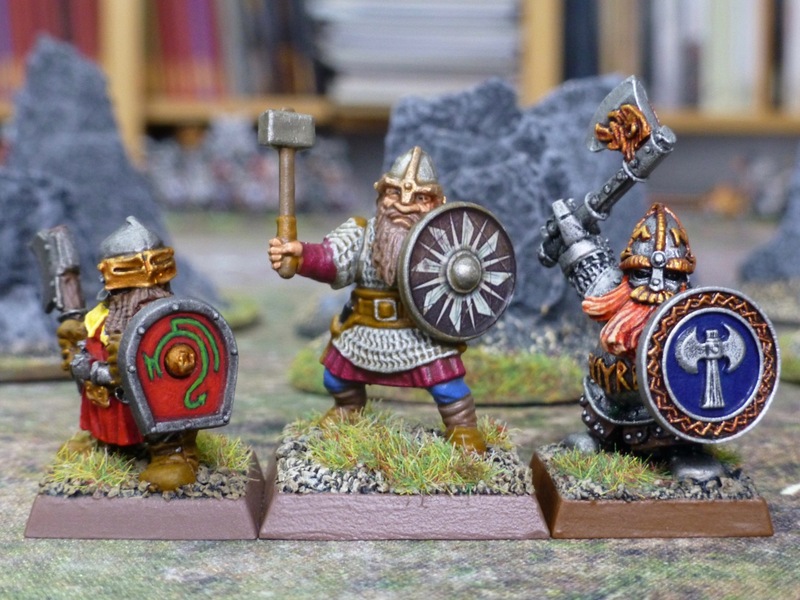 Finally a comparison shot between a Warhammer 3rd Edition Dwarf, Oathmark and a later metal Citadel Ironbreaker. 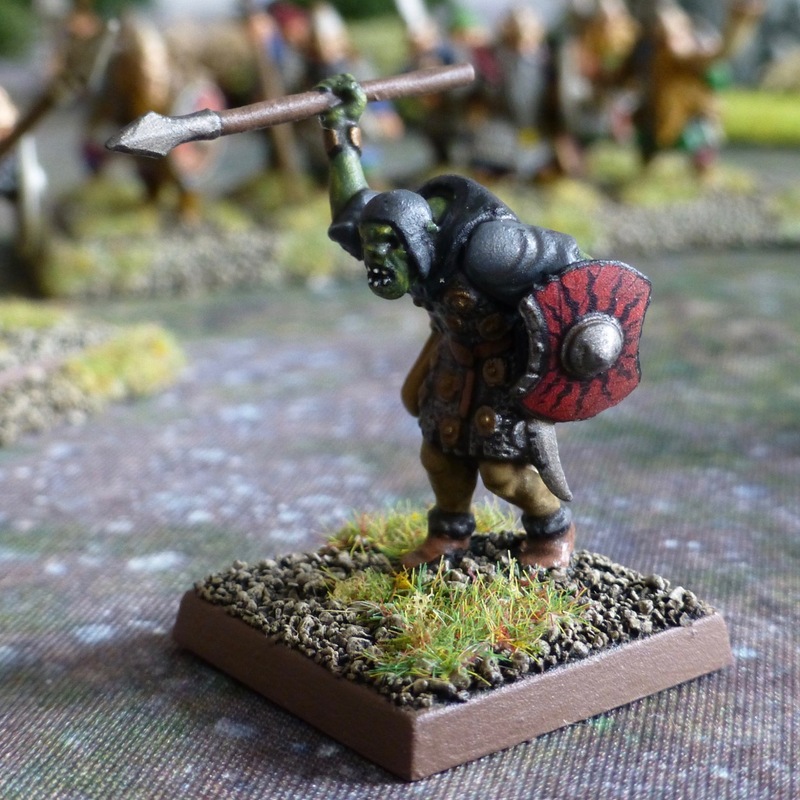 The Oathmark style is visibly different and more ‘human’ in its proportions, while also slightly taller (note that there is also still a plastic tab underneath the feet though, on top of the square base). 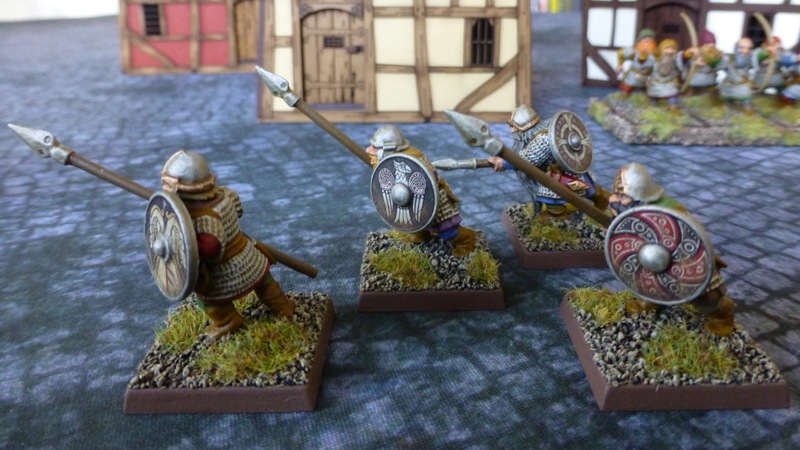 Osprey Publishing has a fantasy mass combat game called Oathmark in the works, which will be supported by miniatures from North Star Figures. 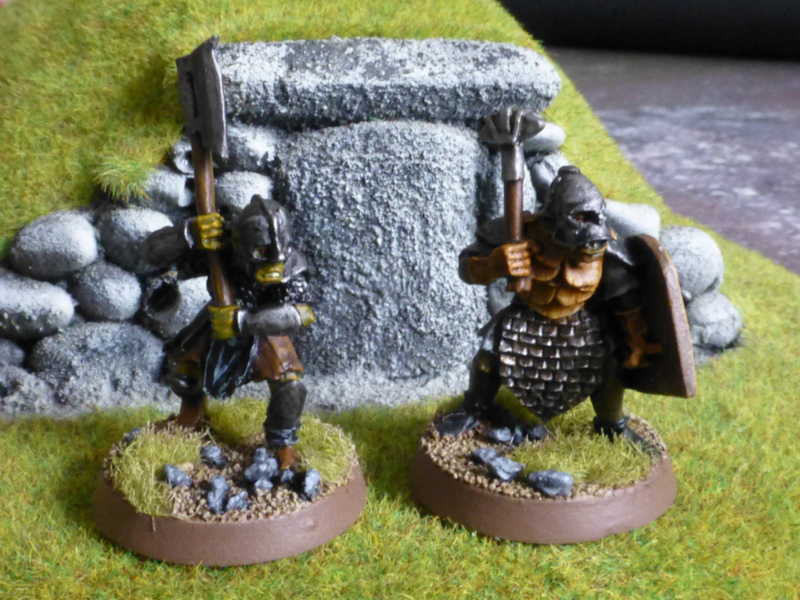 The first plastic regiments for Dwarfs and Goblins are already available, and I jumped in on both during pre-orders. 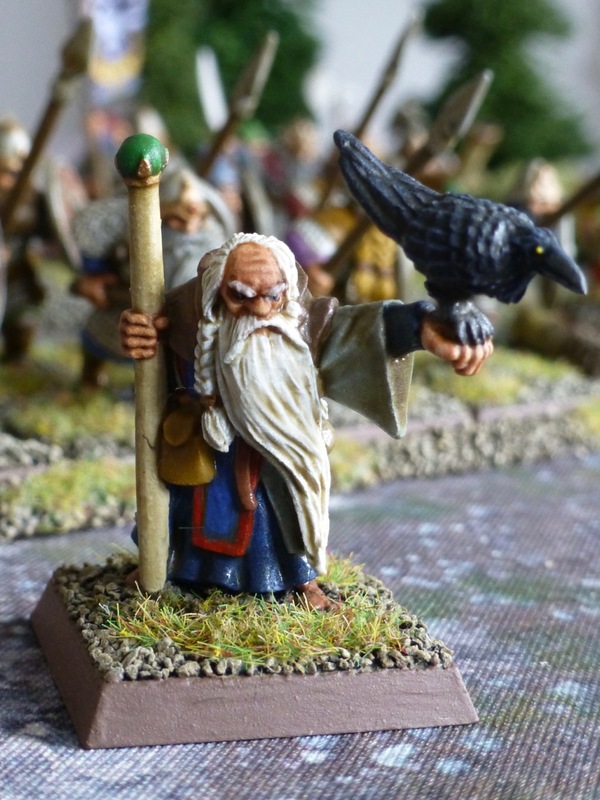 Their classic style really appealed to me, reminding me of Middle Earth roleplaying days. 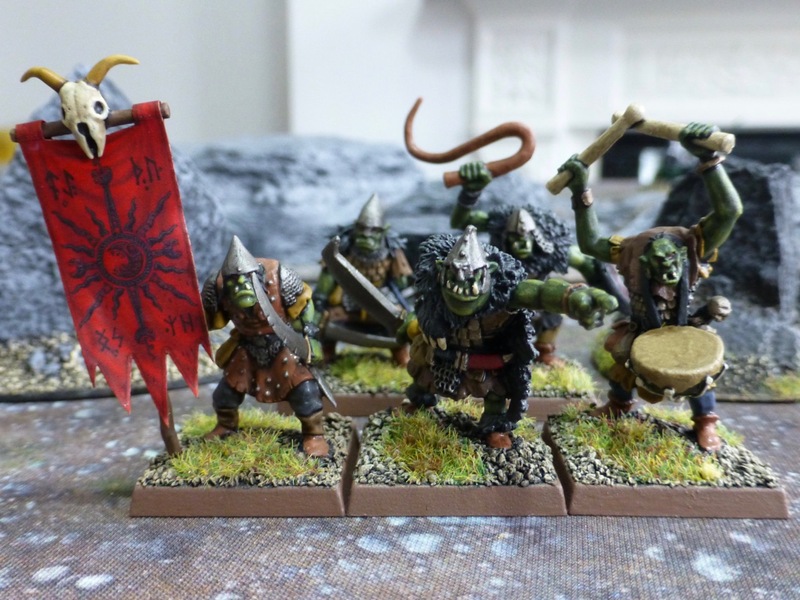 In order to stand any chance of ever completing armies for an entirely new setting (whether it ends up being based in the world of Oathmark or Lord of the Rings remains to be seen), I needed to come up with a fast way of painting. 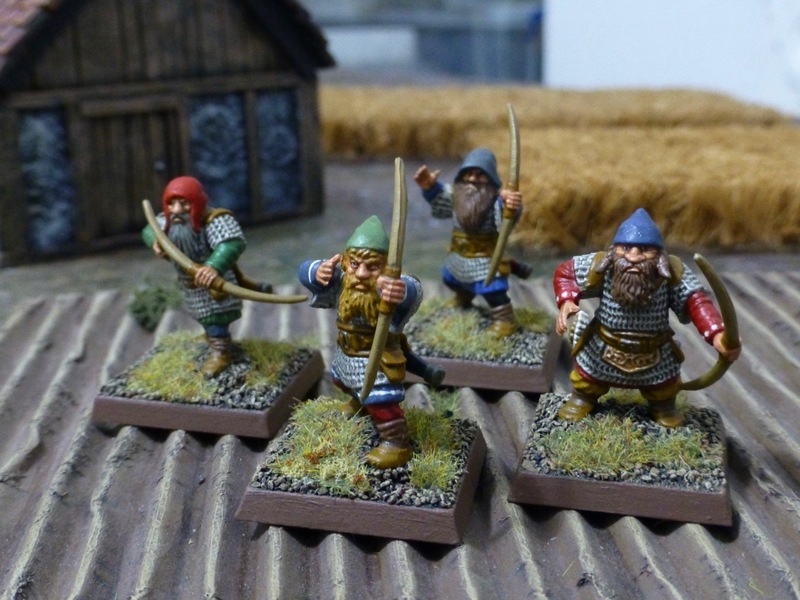 Having tried the Army Painter Quickshade method on my Conan collection to satisfactory results, I used the same approach for a unit of Dwarf archers. Using just three steps of applying base colours, quickshading and then adding small details like eyes and highlights on the skin, I finished these over two days. 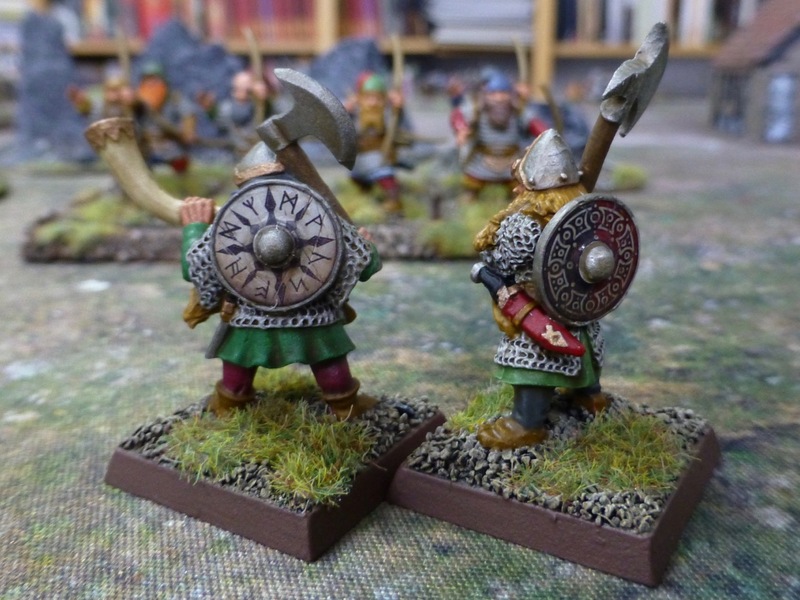 There is no information available yet for Oathmark with regards to unit sizes, but infantry will utilise 25mm bases and rank up. 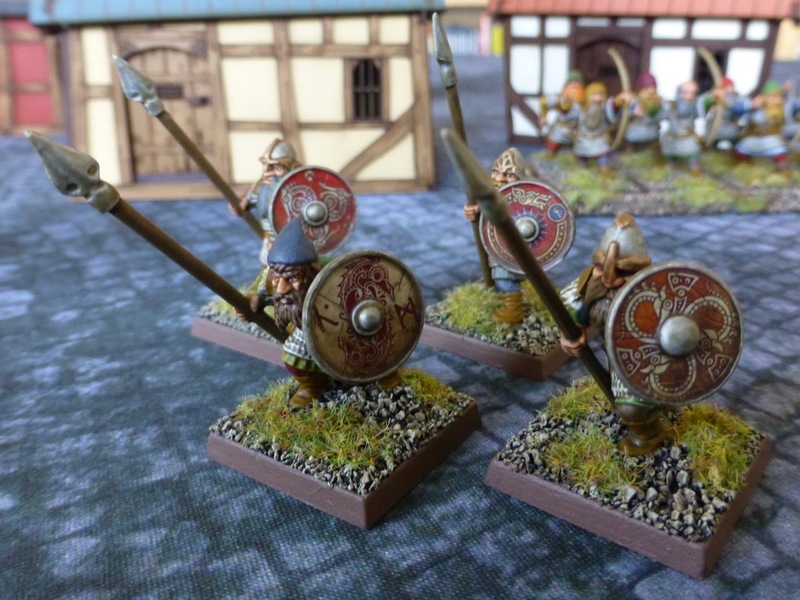 Therefore I have split up the box set and metal figures I purchased into three units of eight – archers, spearmen and warriors with hand weapons and shields. I should be able to build on these later as needed. 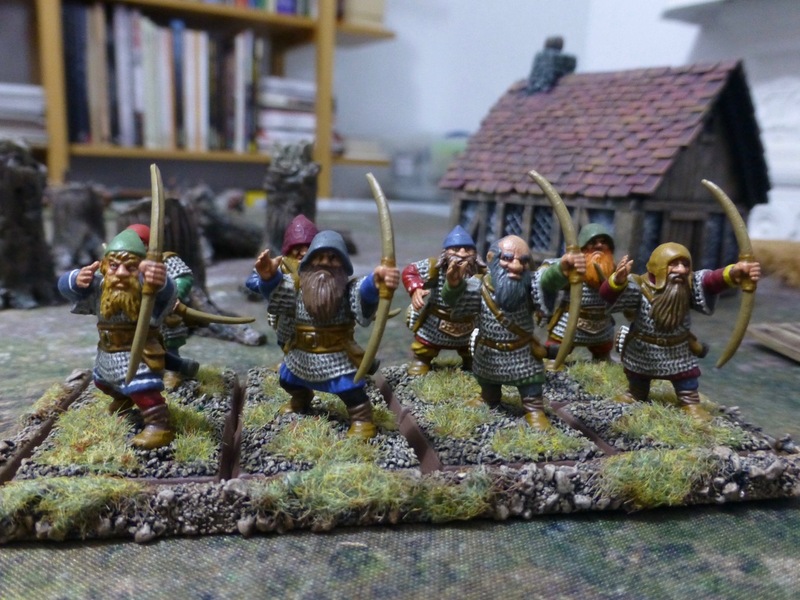 With the second edition of Saga also on the horizon, and Dragon Rampant on my shelf, I can of course always use the figures in a looser formation too. Here seen skirmishing amidst some tree stumps by Urban Construct and a farmstead.